Now if these we're real larvae, I'd be running out of my house screaming in my pajamas! But thanks to HEXBUG, these creatures are mechanical, non-living, neon creatures. (Wipes sweat off face.) A perfect toy for boys, don't you think? 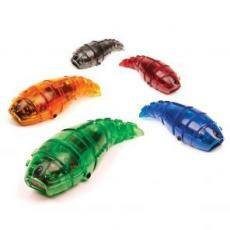 HEXBUG Larva is a micro robotic creature that slithers forward on smooth surfaces. HEXBUG Larva has a built-in sensor to react to its environment, instinctively changing direction upon sensing an object in its path and wriggling off to explore a clear, undisturbed path ahead.